Did you know that in the Star Wars universe, showers are called "freshers?" Yeah, bet you didn't 'cause I'm a way bigger dork than you. But it's a fitting name -- you go in there to freshen up, and in today's post we're going to return the favor. Here are some ways to give your bathroom a new look. 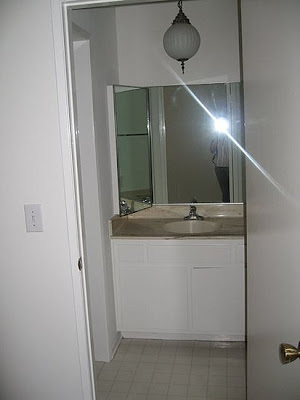 Let's get started with a little inspiration from Erin84's bathroom makeover, as featured on CasaSugar. Since she owns her condo she was able to do more labor-intensive renovations, but we can still translate some of her ideas to be more renter-friendly. Before, and after What I particularly love about Erin's "after" is that even though the sink area is very small, she still uses big pieces (the mirror, the chandelier) to create a feeling of luxury and glamor. Though it's true that you want to maximize your space, and that using smaller and more streamlined fixtures is one way of going about it, don't be afraid to play with scale! Having one or two large items as the room's focal points can make a room feel more spacious than a collection of several small pieces. 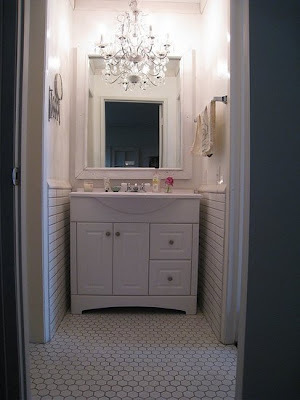 I also love the idea of a chandelier in the bathroom. A gal can really feel like a princess when she's sitting on the throne. (Oh my god, I am so sorry about that pun. It was awful and I couldn't help myself.) But let's say you don't want to tackle installing a big lighting fixture in your ceiling. How about glamour in stick-on form? 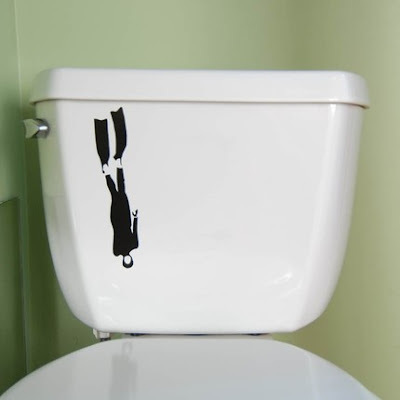 You've seen vinyl decals on walls in the past few years, but they're migrating -- and now you can dress up your toilet tank with them. You can go glam with the chandelier above, or something more whimsical, like this scuba diver. Both are available from Etsy, from Fresh Decals and Heckfire, respectively. 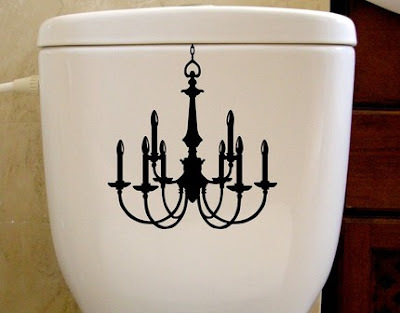 Along with your walls and your toilet tank, you can apply decals to your individual tiles. These "tile tattoos" from Mibo (via 2Jane) have a more limited variety of designs than I'd like, and most of them are pretty busy. Perhaps use a simpler one, like the Shanklin Green pattern below, and use only a few. 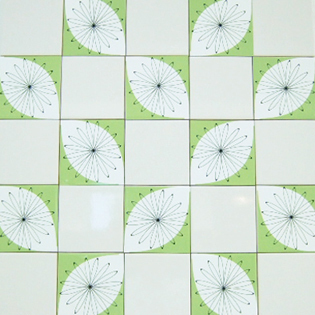 Or just get very small wall stickers (check out Etsy or Blik for inspiration) and create a repeating pattern on your tiled bathroom and shower walls. Having a shower curtain instead of shower doors open up your design options. 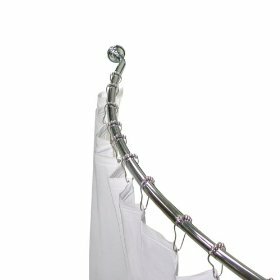 The very first thing you should do is get a curved curtain rod. You'll be amazed at how much more airy your shower feels -- and ladies, it'll help keep you from accidentally getting stuck in a cold, wet curtain as you do your morning contortions to shave your legs. Image from Amazon.com To keep from blocking out too much light, opt for a light, semi-transparent or a clear curtain. (Bonus tip: glue coins -- nickels should be about the right weight -- to the bottom of your shower curtain to help it hang flush against the inside of your tub.) Going back to Erin's makeover, her framed mirror looks much more refined than a plain, metal-edged mirror you typically find on a medicine cabinet. You can still achieve that look without ripping the cabinet from the wall. 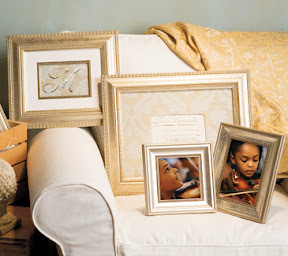 Find a cheap picture frame that's the same size as the edges of your mirror, and use mounting tape like 3m's Command mounting adhesive to stick the frame directly onto the mirror. 3m's Command line is a renter's dream; it holds up anything from photos to posters to light picture frames or mirrors, and when you're ready to take it down, you streeeeeeetch the tape until it releases its grip on the wall, leaving no damage at all. Whenever I move into a new place, I stock up on these because I know I'll find a million uses for them. Via CasaSugar, Etsy, 2Jane, 3m, and Aaron Brothers.